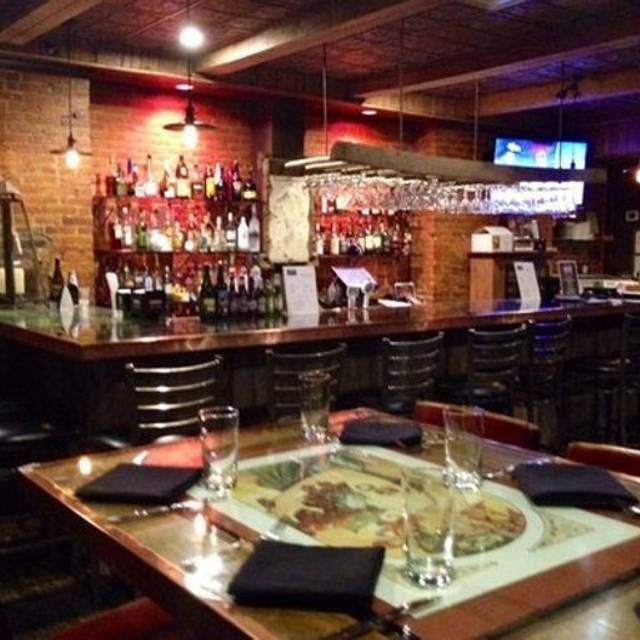 You must make reservations at least 5 minutes in advance of the time at Germano's Piattini. Choice of public lots, garage and off-street parking as well as valet option. Orange Circulator Little Italy stop; Metro Shot Tower stop; Buses 7,10,20,23 and 40. In the upstairs Cabaret, in speakeasy style, Germano's PIATTINI offers “dinner and a show,” featuring jazz, bluegrass, opera, indie music, theater and, of course, cabaret. The Cabaret opens at 6pm for pre-show dining. Performances begin at 7:30pm unless otherwise indicated. Inquire about cover charge. Performances are for dining patrons only. Please note that while reservations in the Gastropub, Barn Room and Tuscan Room can be made over the phone or online, you are only guaranteed a seat in the Cabaret upon the purchase of your ticket. Tickets may be purchased online at germanospiattini.com or by calling the venue at (410)752-4515. Germano's PIATTINI has earned a reputation for creating unique and delicious dining experiences. For a full listing of the venue's culinary, performance and visual arts events, visit germanospiattini.com/calendar-of-events/. Germano's PIATTINI's Private Dining Team works diligently with event managers to craft memorable on-premises dining experiences for clients and their guests. For more information about special seasonal menus and suggested wine and beer pairings, contact the venue at info@germanospiattini.com or call (410)752-4515. The Gastropub seats 40 among high-top tables and bar. Renovations include original brick façade and terrazzo brass-inlaid floor. The stunning bar, charcuterie station and tables are constructed of repurposed barnwood with wrought iron hinges and are glass topped with copper fittings. A hand-carved Amish ladder floats above the bar, converted for bar utility. The Cabaret seats 90 and is outfitted with an in-tune Yamaha G-1 baby grand and sound system. Vintage posters and artwork from the owner’s personal collection adorn the walls of the restaurant. Best Italian cuisine for reasonable price. If we are in ther area, we make it a point to dine there. I've loved this place and have been dining here with a friend for years. You know places that are bigger or fancier, but you won't eat as well or be treated any better than here. From the first step in the door, you'll feel welcome. I especially love the small cozy first floor dining room. Small plates or full entre? You won't go wrong with any choice. Good wine list too. Our server on Friday evening was Jeannie, and she was great; knowledgeable and personable. Service was well paced, and the atmosphere encourages conversation. No loud music or kids or cell phones! Just civilized quiet. I'm already looking forward to my next visit. Lovely welcome from the owner, and great service for a large group in their upstairs room! Food, drinks and service was great! Bartender made us anything we asked for. Germano's Piattini is excellent...great food choices. We were with six people, one who is a vegan and GP has a menu dedicated to vegetarian, vegan, and gluten free options. The owners and the waitstaff are wonderful - very attentive and sincere in their approach in asking if we liked everything, especially the food, which is wonderful. We have been there several times and we're planning to go again next week. Very cozy. Staff were excellent and very attentive. Food is amazing. Can’t wait to go back. We were so excited to try this place. Unfortunately the service was incredibly slow and our food took almost an hour to receive. I was very excited to try this place; however the flavor of the food was a total disappointment. Based on a combination of service and food quality I would not return. I'm trying to give this place the benefit of the doubt - maybe the chef was just having an off night. The brussel sprouts were why I gave them 2 stars instead of 1 for food. The entrees - lasagna and veal marsala both were served barely above room temperature. The lasagna probably would have been fine if not for the temp it was served. The veal was chewy and just not that tasty. Hands down probably one of the worst places I’ve been to in Baltimore. Not only did it take 45 minutes for a beer, to our table, the salad stank, looked old af and the blue cheese had been replaced with cauliflower. Multiple tables were sending their food back i think we were the only ones that walked out in disgust. Chin up Germanos, you’ll not be getting my business again. We went on Valentine’s Day. The portions were very small. We got the eggplant Parmesan, which did not come with pasta or cheese. We found that very odd. Additionally, when desert came out we both ordered the cheesecake. One of the slices had a hair that was cooked into it. Instead of doing something for the inconvenience/grossness of having hair cooked into food, they brought us a new slice, but did not adjust the bill. Overall in was a bad experience. It was the second time that we visited the restaurant. This time we had another couple with us. Four people meant that we could taste four different appetizers and four different entrees if we so desired. The shrimp and Cannellini beans, and the octopus were outstanding as apps. The red beet ravioli delicious. The saltimbocca wonderful. Bolognese yummy. The wine list not extensive but good at both ends of the price range. Service was great with no rushing. Prices very reasonable. Great night, great dinner. It was Ok - But it always makes me wonder if something is wrong when a restaurant id empty on Saturday night. Great food. Great customer service. Diondre was our server and he was exceptional! Great service and a delicious meal served in a beautiful venue. I didn't have a chance to see the cabaret show this time, but that is a treat in and of itself. Come for the food or the entertainment. Either way, it's well worth your money! Excellent place to eat! We loved Dean as our waiter and definately recommend the house made cheesecake! Came for restaurant week. Polenta appetizer and lasagna were ok. I am a lover of tiramisu and was so excited to try theirs. However, tiramisu from the cheesecake factory is sooooo much better. My husband looovvvvedd the cheesecake! He said it was the best part of the whole meal. Dean was a great waiter. Had dinner here on New Year's Eve, not a first visit. I love this place. I have to admit that I was disappointed to not get a seating in the upper dining room because I enjoy the ambience more. But the foodasalways was excellent. The food was delicious! Chef David Rekoski is a genius!! Seems to be very good for pastas only. My veal marsala was about a half inch thick and very chewy. Not pop punded out at all. My Wifes salmon was also NVG. Germanos is wonderful! We ate there for the first time when we attended a fundraiser. It was so good that we went back another time. Their lasagne is to die for. My husband had fish and that was equally as good. The owners and staff are extremely friendly and attentive. Very reasonably priced. They have a separate vegan menu, which is really awesome!! Delicious food! Our family of 5 had lunch. Wonderful food, great atmosphere, nice wait staff. Even my 5 year old enjoyed the food! Will return. We have been going to Germanos for many years and have seen the different incarnations of Germanos. Sadly, the restaurant seems to be on its last legs. The valet parking is gone. Luckily we were going for an early dinner on a weekday and were able to find reasonable parking in a lot several blocks away. We were greeted warmly and led to a nice table by the window. Our server was completely inept. She appeared to be new at serving. She had troubles opening the bottle of wine we ordered and held the glass not by the stem but by the bottom of the the bowl. After my husband tasted the wine, she poured his glass then poured my glass, which is poor etiquette from a restaurant that charges Germanos prices. She wanted us to order quickly and kept coming by the table to see if we were ready. She mispronounced many of the items on the menu. We started with the bruschetta which was a medley of sautéed vegetables that was a ghastly mix of unpleasant flavors. My chicken cacciatore was so so. The chicken was moist but the sauce tasted as though it came from a jar. Again our server kept coming to the table asking whether we were done. About half way through our entree, she came by with the dessert menu. It is unfortunate to see a once nice restaurant fall to such a low level. Great food. Service was friendly, but slow. Would go back. A nice standard 'Italian American' place with good service. Overpriced for what we got: $22 for a smallish plate of spaghetti with 5-6 shrimp and (the usual Italian American eatery) no vegetables. Good food and service. Portions are small. Nice ambiance. We were in Baltimore on business and found Germano’s Piattini after a very busy few days. The food choices are diverse and difficult to chose from. The red beet ravioli and the shrimp with linguine were delicious. Our server Keith recommended substuting the house made pasta for the linguine which was terrific. Perfectly cooked. We love vegetables, so the brussel sprouts with ricotta cheese and bacon were wonderful along with the grilled artichoke, which made the meal. We finished off with homemade cheesecake and tiramisu. The best cheesecake ever! You can’t go wrong at Germano’s Piattini. We went to Germanos after reading some local reviews. My wife and I and another couple had concert tickets and we went to Germanos before for dinner and wine. We were not dissapointed ! Everything about Germanos was exceptional, from the service, the food and the wine selection. We would definitely recommend this restaurant and would go back again ! The food was good but service kind of slow. Wine was good but mixed cocktails were weak. We will definitely go back and try the cabaret. Wonderful food and service! Will be back the next time I’m in town! My wife and I were looking for Italian between the Yankees doubleheader games, we walked to Little Italy and after searching Yelp found Germano's. We were seated immediately near a window, and the server was at the table quickly which we appreciated, as we were thirsty from the walk. Germano's does things a little differently, they serve tapenade with the bread, which we really enjoyed. My wife ordered the lasagna, I was craving two things on the menu and ordered the spaghetti aglio e olio and the porchetta. All of these were very tasty, the spaghetti was al dente as I like it and had just the right amount of oil. The only knock and why I scored it a 3 for value is the portion sizes are smaller than what we expected and what we would have expected for the price. Overall a good experience. This was an excellent place to have my wife's birthday dinner. They had an excellent selection of vegetarian options. It's always a place where we dine when we visit family in Baltimore. It is always welcoming with impeccable service and wonderful food.